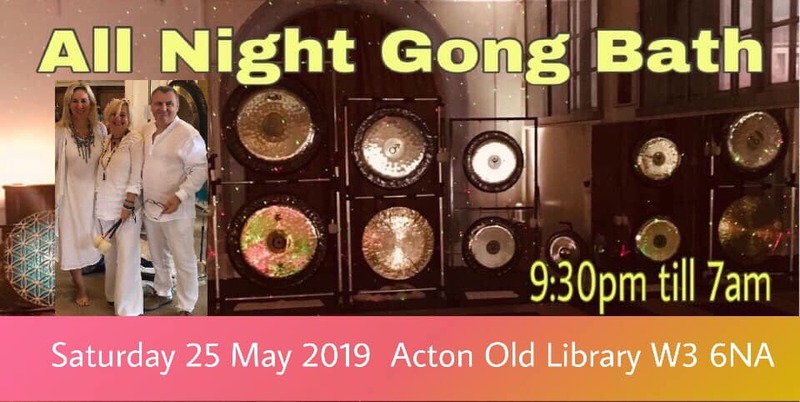 We are delighted to invite you for “All – Night Gong Puja ” on Saturday evening 25 may 2019 – a unique and magical gong experience at The Amazing Old Acton Library. This is a night to surrender to the guidance of your soul, to dive deep into self healing meditation, lucid dreaming state and purify subconscious blocks. It is an exquisite vibration and sound journey till sunrise with 9 powerful gongs and 3 experienced teachers and healers. Gongs are amazing instruments. They generate powerful, intense healing vibrations which, stimulate feelings of peace and relaxation. This allows the release of stress and enhances well-being. The Sound of Gongs opens the gates of Love, so you can connect with all. The things you create around yourself and realize just how great a power you have to create your own happiness and well-being. The Gong Puja can help you to remove emotional aspects out of the body, creating empty space to fill it with love and tranquility. Are you ready to open up and receive? We will begin the evening with the Mantra to tune into our Souls and gentle kundalini yoga stretches to allow our bodies to open up to the energy to flow smoothly and prepare for sound waves to heal. Then there will be a short break to set up your ‘sleeping nests’ for the all night Gong Puja. with the new zest for life! At the beginning of the night the sound might feel quite intensive at moments. After a while we will keep it gentle and comforting till the early morning. At around 5:30am the gongs will go silent for 30 minutes of stillness & reflection; during this time you will dive into SHUNIA – state of deep listening, deep silence. To be gently awaken by the sounds of the shabd, a healing mantra as you gently stretch into new you, into new life. Clean comfortable clothing, pillows, sleeping bag, blankets, duvets, camping/yoga mat or any other item that will help you to be comfortable as you will be sleeping on the floor. We’ve heaters in the hall, but please be sure to bring warm clothes i.e. socks/slippers/jumpers & anything you will need to ensure you’re nice and warm throughout the night. Please also bring a bottle of drinking water & snacks to share for our breakfast. Have a good meal at least 1 hour before the event, but not too heavy, and strictly no alcohol/drugs. Free parking at the car park near the venue. The Gong Bath will be lead by Gong Masters Teachers: Jarek Okide, Beata Dźwigoł & Wioletta Diamondheart. Wioletta Diamondheart aka Jai Dev Karam Kaur – kundalini yoga & meditation teacher, holistic therapist & Soul Journeyer. Beata and Jarek Dzwigol are Gong Masters trained by Don Conreaux, Aidan McIntyre, Tom Solton and Abby Del Sol and offer group and one-to-one sessions.